The three VBC plug-ins can be used individually or together in the FG-Rack plug-in. You wait ages for a Virtual Buss Compressor, and then three come along at once. Mix-bus compression is a double-edged sword. Used properly, it can deliver additional loudness, and help to tackle problems commonly associated with mixing in DAWs, applying coherence and 'glue' — yet it can just as easily ruin your mix completely. Most of us have probably found ourselves wondering whether putting a compressor across the mix bus will make things better or worse, and wondering which compressor to use. Slate Digital's answer to this dilemma is to give you not just one compressor but three. 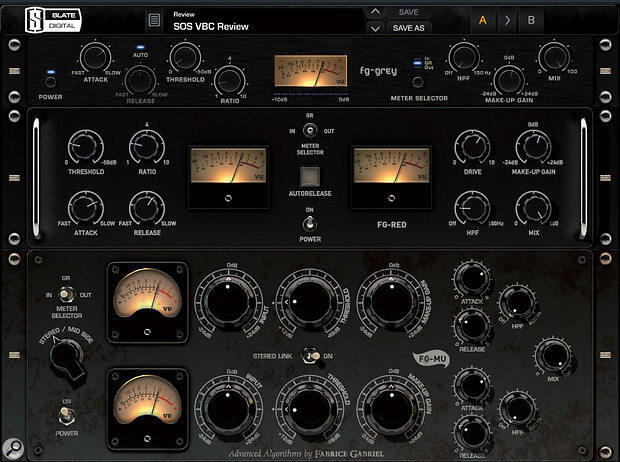 Virtual Buss Compressors (VBC) is a software bundle comprising three plug-ins created in the image of some of the most sought-after hardware mix-bus compressors, plus a fourth plug-in that combines all three models in one interface. The VBC bundle is authorised to a second-generation iLok USB key and is available for both Mac OS and Windows in Audio Units, VST and VST3 formats (32- and 64-bit) as well as RTAS and AAX1 (32-bit only). A 64-bit AAX2 version is in development. In the initial release, the VST3 versions did not work in Cubase 7 (64-bit), but this was soon fixed in the 1.0.1.6 public beta. Aside from that, there have been no stability issues. The FG-Grey plug-in is modelled on the SSL 4000 G-Series Buss Compressor that is, arguably, the mother of modern mix-bus compression. Some say it is also the source of the additional 's' on the word 'buss'; I'm not sure about that, but it certainly popularised this spelling. Built into a state-of-the-art mixing console, the SSL Buss Compressor quickly became an industry standard, not least because it kept clients happy by making their works in progress sound more like finished products. You might say that the SSL Buss Compressor started the modern practice of mixing into the compressor rather than applying compression post-mix. FG-Grey is an emulation of the famous SSL 4000 G-Series Buss Compressor — with some added ingredients. While 'grey' refers to the original hardware's colour scheme, the initials 'FG' represent the man who coded these plug-ins, Steven Slate's in-house genius Fabrice Gabriel. Avoiding trade names, obviously, has a lot to do with licensing, but it has also given Slate and Gabriel a chance to add some features that go beyond the original. Like all of the VBC plug-ins, FG-Grey offers a variable high-pass filter in the side-chain, which lets you decide how much influence low-frequency mix elements such as bass and kick drum should have over the compression: depending on the musical style, some pumping can actually feel quite nice. Another addition to all three plug-ins, not present in the original hardware, is a Mix knob for instant parallel compression. The set of controls is standard for a VCA compressor — attack, release, threshold and ratio — and FG-Grey is probably the easiest of the three to configure, because the parameter ranges are sensibly chosen. However, the black knobs with their thin markers are quite hard to read against an almost black background. It's easy to overlook the Auto release button, which typically gets a lot of use in mix-bus applications. Unlike the hardware, which only has three ratio settings, the lowest being 2:1, FG-Grey can do 1.5:1 for a softer type of compression. For accuracy's sake, I should mention that FG-Grey also omits one feature of the original hardware: the auto-fade button. I'm sure it had its uses in analogue times, but now that we have DAW automation, I doubt that many engineers will miss a knob for automated fade-outs. One thing I dislike, however, is the fact that FG-Grey isn't level-matched. Just plugging it in without any processing going on increases the level by 1.5dB. It seems a bit odd to call a plug-in FG-Red when its GUI is a very dark shade of grey, but in this post-modern world, nothing is what it is, and everything becomes a reference to something else. Red, thus, is not the colour of the plug-in's own (virtual) faceplate, but that of the Focusrite unit it emulates. The Red 3 Compressor/Limiter may not be as popular as the SSL Buss Compressor, but as mix god Chris Lord-Alge is a prominent user, chances are you've heard it in action a million times. FG-Red is modelled after the Focusrite Red 3 compressor/limiter, a favourite of Chris Lord-Alge's. The parameter set, again, is typical for a VCA design: attack, release, threshold and ratio. But while FG-Grey has stepped attack and release controls showing actual values in milliseconds, FG-Red has continuous controls going from 0.0 to 10.0. This makes the Focusrite emulation a bit more difficult to operate than the SSL clone, at least for me. Unlike the Focusrite hardware, FG-Red cannot be run with channels unlinked. This may seem appropriate for its intended application, but sometimes it just sounds more energetic to run a stereo compressor in dual mono mode, especially on the drum bus. On the plus side, as well as the variable side-chain high-pass filter and Mix knobs, Slate have added a third feature. Apparently, many users of the Focusrite hardware like the unique saturation characteristics of its output stage when driven hard, and FG-Red's Drive knob allows you to add some grit without readjusting input and output levels. The FG-Mu plug-in is based on the ancient Fairchild 670. For consistency, it should perhaps have been named FG-Black, but then again, some Fairchilds had a grey panel — so instead of the faceplate, it is the compressor topology that lends the plug-in its name. 'Mu' refers to a tube's gain factor. One of the earliest ways to construct an automatic level control, long before the advent of VCAs, was to vary the gain of a tube stage by reducing its bias current in relation to the audio signal. FG-Mu, named after its compressor topology, is a variation on the classic Fairchild 670 tube compressor. These analyser plots show harmonic distortion and noise for the FG-Grey (left), Red (right) and Mu (bottom). The Grey model has relatively high total harmonic distortion (THD) for a solid-state design; the Red is cleaner, but can be driven into saturation using its Drive control, while the Mu model has the most distortion and noise, as you'd expect.FG-Mu is the only VBC plug-in that bears a passing resemblance to its hardware counterpart. The VU meters are similarly shaped, and there are big, vintage-style knobs. Yet again, however, Slate have incorporated extra features. While the original Fairchild 670 merely had a couple of controls per channel for input gain and threshold, plus a six-position time-constant switch, the FG-Mu has separate knobs for attack and release time, as well as an additional output-level adjustment. The latter can be used in conjunction with the input-level knob, to set the right amount of (virtual) tube saturation. Like the original, FG-Mu has no ratio control. The Fairchild 670 was originally designed as a limiter, but — typically for a variable-mu tube design — its compression curve has a very soft knee, ranging from about 2:1 at the onset of compression to full limiting (about 30:1). Its soft characteristics, along with its rather fast attack and longish release times, mean that it is not always ideally suited to today's hard-hitting pop music. After all, it was designed before rock & roll made any real impact. With its separate attack and release controls, Slate's FG-Mu is a bit more versatile than the original, but it is not your typical modern mix-bus compressor. However, FG-Mu performs nicely on everything for which people typically use a Fairchild these days, which is mainly vocals, string sections and slow-moving stuff, and it does work well as a mix-bus compressor on songs without drums, or vintage-flavoured tracks with the percussive elements mixed further back. Sadly, FG-Mu has no auto button to self-adjust its release time to complex programme material. Even the ancient Fairchild 670 had an early form of auto release in its final two switch positions. However, I'm glad to see that Slate have salvaged the original's distinctive mid/side mode. On the Fairchild 670, this mode was called 'lat/vert' because that's how vinyl records are encoded: lateral (side to side) movements of the needle contain the mono Mid signal, while the vertical excursions carry the Sides channel, ie. the stereo information. Fifty years later, M/S processing still is a powerful tool — not so much for typical mix-bus applications, ie. mixing into a compressor, but for creative purposes on instrument or group channels. It can also be a valuable tool for rescuing flawed mixes: you could, for instance, bring out the ambience in a stereo recording by compressing the Sides channel without affecting the lead vocal too much, since this typically inhabits the Mid channel. The Mix Buss Compressors bundle includes a fourth plug-in called FG-Rack, which contains all three compressors in series. If that sounds like a bit much, well, it is! But the main purpose of this virtual rack really isn't to have three processors compressing the hell out of your mix bus. As you can switch off each compressor individually, you can use FG-Rack to audition all three compressors and keep just the one you like best on a given track. Another application would be to combine certain properties of each model; for instance, employing FG-Grey for punch and adding subtle saturation from FG-Red by setting its ratio to 1:1 and turning up the Drive knob. The sequence of the three compressors can be altered by dragging and dropping their virtual faceplates. In action, I was quite impressed by the Slate collection. Each of the Virtual Buss Compressors comes with a distinct sonic personality. FG-Grey is the snappy one, excellent for in-your-face pop; FG-Red would be my first choice for rock tracks, due to its saturation function; and FG-Mu provides a lush bloom with a vintage flavour for slow tracks. None of the compressors is entirely neutral. They all introduce some degree of harmonic distortion, and while the two VCA designs are fairly linear in the frequency domain, FG-Mu displays a gentle bump in the 2kHz region. All three also introduce an ever-so-slight noise component; at about -120dBFS, you're not likely to hear it, but Fabrice Gabriel feels that noise is an essential component in recreating an analogue feel (see SOS's review of the Slate Digital Virtual Console Collection in October 2011: /sos/oct11/articles/slate-vcc.htm). Slate Digital call this "the non-linear difference”. Indeed, if you feed them into an analyser, the VBC compressors behave pretty much like analogue gear. It's hard to say whether these non-linearities are responsible, but on a subjective level, too, the VBCs feel 'alive' and 'complex', where lesser plug-ins feel lifeless and static. While the two VCA models are pretty much linear in the frequency domain, FG-Mu's frequency plot shows a gentle bump in the 2kHz region.I'm an avid user of Universal Audio plug-ins, so I tested Slate's FG-Grey and FG-Mu against their UAD counterparts. FG-Grey came across like a hybrid of the UAD SSL G-Series and Precision Buss Compressor plug-ins, combining the particular SSL vibe of the former with the more modern features of the latter. I'd still prefer the UAD Precision Buss compressor whenever sonic transparency is paramount, such as for predominantly acoustic music and mastering purposes. But sonically, FG-Grey is every bit as good as the UAD SSL G-Buss, yet more flexible and versatile. The FG-Mu, too, compares well with its counterpart, the UAD Fairchild. Feature-wise, the UAD plug-in is the more accurate emulation of the Fairchild 670 and retains its auto-release feature, but the Slate FG-Mu sports some useful additions, such as the Mix and side-chain filter knobs, as well as separate attack and release controls for a wider range of adjustments, though it lacks the UAD Fairchild's bias trim pot to manipulate the compression curve. Despite these differences, both react in a similar manner, and sonically they're on the same level. One practical advantage over the UAD plug-ins is that the Slate VBC compressors do not introduce additional latency. The Virtual Buss Compressors bundle may not be as radically new as some of Slate Digital's previous offerings, but it's rare to find so much sonic detail and realism in a native plug-in. Even though Slate have taken some liberties, the emulation quality is exceptional: these plug-ins sound and feel like working with analogue equipment, and the included Focusrite Red 3 emulation is a rarity in the plug-in world. What are the down sides? With their carefully modelled non-linearities, which cannot be turned off, the VBC plug-ins may not be ideally suited to ultra-clean processing such as is required in some mastering applications, as they will always impart a certain flavour. On the practical side, you need a second-generation iLok key even to demo VBC, although at the time of writing, the VBC bundle comes with a free iLok, and at £169$249 it is attractively priced — you can spend as much on just one plug-in of similar quality from a competitor, such as the above-mentioned UAD SSL G-Buss. Three tubes of sonic glue for the price of one is a bargain, without any doubt. The only question is whether your tracks need that much adhesion! The saturation characteristics of the original hardware are modelled with unusual accuracy. Includes three compressors with distinct personalities. Compressor models can be combined in the FG-Rack plug-in. Mix and side-chain high-pass filter knobs on all three plug-ins. Stereo linking cannot be switched off on VCA models. FG-Mu has no auto release function. Slate's VBC provides convincing emulations of three sought-after mix bus compressors. Thanks to careful modelling of the behaviour and distortion characteristics of the hardware originals, the VBC plug-ins manage to produce a quasi-analogue feel. Windows PC with 3.5GHz Intel Core i7 2700K quad-core CPU and 16GB RAM, running Windows 7 Pro 64-bit. Tested with Steinberg Cubase 7 64-bit.